Much on the expected lines, the Indian Equity Markets saw some respite from the weakness that it was seeing over past couple of sessions. The NIFTY50 remained range bound all throughout the day and ended the session on a flat note putting negligible gains of 5.95 points or 0.06%. Also, we had mentioned about the levels of 10180-10200 playing out as immediate resistance for the Markets. The Index resisted precisely at 10179 and retraced from there. Stepping into trade for Tuesday, these levels of 10180-10200 will continue to pose immediate resistance for the Markets while the levels of 100-DMA will stand as important and critical supports in event of any weakness. 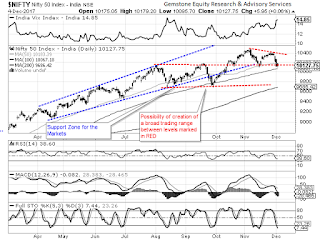 The 10165 and 10200 will act as immediate resistance for the Markets. Supports come in at 10067 which is the 100-DMA for the Markets. The Relative Strength Index – RSI on the Daily Chart is 38.5997 and it stays neutral showing no divergences against the price. The Daily MACD is still bearish as it trades below its signal line. No significant formations were seen on Candles. The pattern analysis shows possibility of a minor Double Bottom support shaping up near 10100. The 100-DMA remains in very close vicinity of this and therefore, in immediate short term, we are unlikely to see any significant downsides. Overall, the rising Open Interest that has been coming in over previous two sessions also point towards building shorts in the system. These shorts are likely to lend supports at lower levels. However, as of now what we can expect is a technical pullback only. 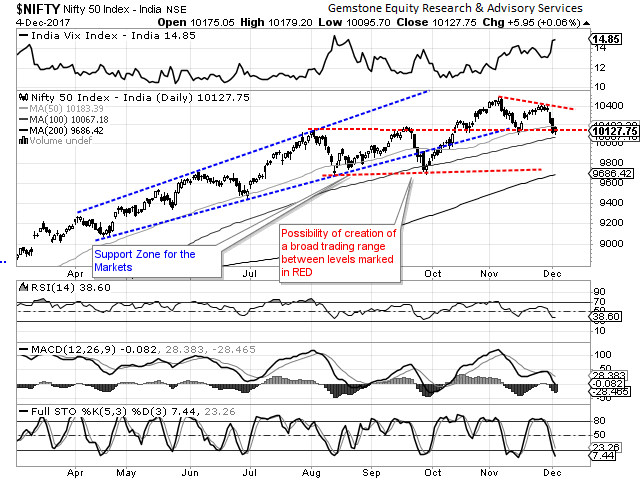 Resumption of up move shall occur only once the NIFTY moves past the levels of 10180-10200. Until this happens, while completely avoiding shorts, we continue to recommend keeping exposures moderate and adopting a cautious view on the Markets.